Rule 13p-1 under the Securities Exchange Act (17 CFR 240.13p-1) for the reporting period from January 1 to December 31, 2018. A copy of Apple Inc.s (Apples) Conflict Minerals Report for the reporting period January 1, 2018 to December 31, 2018 is provided as Exhibit 1.01 hereto and is publicly available at investor.apple.com/sec.cfm. * Apples determination and related disclosures relating to materials that may come from recycled and scrap sources are included in Apples Conflict Minerals Report and incorporated by reference herein. Exhibit 1.01  Conflict Minerals Report for the reporting period January 1, 2018 to December 31, 2018. The reference to Apples website is provided for convenience only, and its contents are not incorporated by reference into this Form SD and the Conflict Minerals Report nor deemed filed with the U.S. Securities and Exchange Commission. Apple is deeply committed to upholding human rights across its global network of suppliers that support the manufacturing of its mobile communication and media devices, personal computers, and related accessories. Apple works to safeguard the well-being of people involved in its supply chain and to protect the places where materials are sourced. Through its strict supplier standards, Apple commits to use minerals in its products that do not directly or indirectly finance armed conflict or benefit armed groups. As of December 31, 2018for the fourth straight year100 percent of identified smelters and refiners1 in Apples supply chain for all applicable products2 manufactured during calendar year 2018 participated in an independent third-party conflict minerals audit (Third Party Audit) program for columbite-tantalite (coltan), cassiterite, gold, wolframite, or their derivatives, which presently are limited to tantalum, tin, and tungsten (collectively, 3TG). In 2018, Apple directed its suppliers to remove from its supply chain five smelters and refiners not willing to participate in, or complete, a Third Party Audit or that did not otherwise meet Apples requirements on the responsible sourcing of minerals. Of the 253 smelters and refiners of 3TG determined to be in Apples supply chain as of December 31, 2018, Apple found no reasonable basis for concluding that any such smelter or refiner sourced 3TG that directly or indirectly finance or benefit armed groups. Apple is committed to going beyond the minimum requirements in order to meet and exceed internationally accepted due diligence standards and protect people in its supply chain, with the ultimate goal of improving conditions on the ground in the Democratic Republic of the Congo (DRC) and adjoining countries. First, Apple maintains a strict Supplier Code of Conduct (Supplier Code) and Supplier Responsibility Standard on the Responsible Sourcing of Materials (Responsible Sourcing Standard) that apply to all levels of its supply chain and require suppliers to engage with smelters and refiners in Apples supply chain to assess and identify a broader range of risks beyond conflict risk, such as social, environmental and human rights risks. Second, Apple annually reviews reported incidents and public allegations of abuse that are potentially linked to certain smelters and refiners in its supply chain, and uses that information to help improve 3TG traceability and Third Party Audit programs. Third, Apple supports grassroots and whistleblower initiatives that empower independent, local voices to raise issues and report abuses at the mine-site level and throughout the supply chain. Finally, as part of its commitment to help to safeguard the well-being of people involved in its supply chain, Apple has integrated human rights impact measurements into its overall minerals due diligence program. Apple products that were manufactured, or contracted to be manufactured, during 2018 and that contain conflict minerals. These products are Apples iPhone®, iPad®, Mac®, iPod®, Apple TV®, Apple Watch®, AirPods®, HomePod, Beats® products, and Apple accessories. As the African Great Lakes region faces ongoing challenges to achieve lasting change, Apple remains committed to continue responsibly sourcing 3TG from the region. Apple believes that all stakeholdersgovernments, non-governmental organizations, industries, and local communitiesshould enhance their efforts to implement comprehensive due diligence programs and work together to measure impact and improve conditions in the region. Apples human rights and responsible sourcing program includes due diligence on the source and chain of custody of 3TG in its global supply chain (see Annex I). It has been designed to conform in all material respects to the five-step framework of the Organisation for Economic Co-operation and Development (OECD) Due Diligence Guidance for Responsible Supply Chains of Minerals from Conflict-Affected and High-Risk Areas (2016) and related Supplements (the OECD Due Diligence Guidance). In accordance with the OECD Due Diligence Guidance, Apple believes it constitutes a downstream company in that Apple or its suppliers purchase 3TG related materials after processing by smelters or refiners. Apple designs and manufactures products requiring resources from all over the world, including from a global network of suppliers that provide materials, components, and product assembly. The operations of its suppliers range in size from a few employees to hundreds of thousands employees, and in aggregate these suppliers employ millions of people at their respective facilities every year. Aligned with Step 1 of the OECD Due Diligence Guidance, Apple has robust internal management systems overseeing Apples human rights and responsible sourcing program. Apples Board of Directors oversees Apples CEO and other senior management in their implementation of Apples program. The Supplier Responsibility (SR) team within Apples Worldwide Operations group coordinates activities related to Apples Supplier Code and Responsible Sourcing Standard. The SR team works across a number of Apple business teams and functions, including, but not limited to, Apples legal, finance, environmental initiatives, product design, procurement, manufacturing operations, and retail groups. The SR team also regularly consults with Apples senior management to review progress and set ongoing strategy for its minerals due diligence program. In addition to the responsible sourcing of materials, Apple works to reduce the amount of material mined for use in its products. In 2017, Apple announced its goal to make products from only renewable resources or recycled materials that are sourced responsibly. In 2018, Apple made progress towards this goal by increasing the use of recycled materials in Apple products, including certain recycled 3TG. Apples Supplier Code and Responsible Sourcing Standard apply to all levels of Apples supply chain and are based on industry and internationally accepted principles, such as the United Nations Guiding Principles on Business and Human Rights (UN Guiding Principles), the International Labour Organizations International Labour Standards, and the OECD Due Diligence Guidance. The Responsible Sourcing Standard outlines Apples extensive requirements on the responsible sourcing of minerals, including expectations for 3TG due diligence and related sourcing matters. The Supplier Code is available in 15 languages and the Responsible Sourcing Standard is available in five languages. Apple requires its suppliers to adhere to the Supplier Code and Responsible Sourcing Standard, including any subsequent amendments or updates. Suppliers are required to apply Apples requirements to their suppliers, and so forth, through all levels of the supply chain. In this way, Apple implements its requirement that smelters and refiners in its supply chain comply with Apples strict standards, including that smelters and refiners are required to participate in Third Party Audit programs. If a supplier does not meet Apples requirements, the supplier risks facing a significant reduction in Apples business or may lose business with Apple altogether. Each year, Apple evaluates its Supplier Code and Responsible Sourcing Standard to ensure that it upholds human rights and reflects the values expected by Apple, its stakeholders, and the industry. In 2018, Apple strengthened its Responsible Sourcing Standard by clearly informing suppliers that they should seek to apply best practices in the responsible sourcing of materials, beyond the requirements and best practices included in Apples Responsible Sourcing Standard, wherever possible. Apple anticipates that only suppliers exceeding Apples minimum requirements and operating at the best practices level are likely to remain in Apples supply chain in the future. Apple believes that its strict Supplier Code and Responsible Sourcing Standard, combined with direct engagement with its supplier base, have enabled it to achieve a 100 percent Third Party Audit participation rate of identified smelters and refiners in its supply chain since 2015. In 2018, Apple took steps to further strengthen implementation of the Supplier Code and Responsible Sourcing Standard. To ensure that Apples suppliers understand Apples 3TG sourcing policy, Apple communicates its requirements to its direct suppliers annually and regularly engages with them using tailored communication and guidance throughout the year. In addition, Apple provides suppliers with access to online training materials, in English, Mandarin, and certain other languages, through Apples SupplierCare portal that focus on, among other things, Apples due diligence expectations, practices, and requirements for 3TG reporting. Suppliers can reach out to Apple with questions about 3TG sourcing through SupplierCare or through a dedicated Apple email throughout the year. In 2018, Apple continued to engage an independent audit firm to conduct specialized audits of certain suppliers in order to review their internal management systems and implementation of Apples requirements for the responsible sourcing of minerals. Based on the outcomes of previous audits conducted, Apple designed tailored training that is specifically aimed at assisting suppliers to close identified gaps in suppliers systems and implementation processes. In many instances, this training was provided in person to suppliers, while, at the same time, it was recorded for further distribution across Apples supply chain. Apple also maintains a grievance mechanism through a dedicated 3TG email address that allows suppliers to report concerns or grievances in connection with 3TG mining, processing, and trading. The concerns or grievances submitted through this mechanism are then reviewed with the participation of relevant Apple business teams, and follow-up activities are conducted as appropriate. Apple works to make industry-wide progress on responsible minerals sourcing, beyond its own supply chain. As part of this commitment, Apple engaged with a broad range of civil society, industry, and government experts and partnered with the Enough Project, an international human rights organization, to convene a series of expert group meetings to discuss opportunities to work collectively on innovative approaches to the responsible sourcing of minerals in the supply chain. Starting in 2017, as part of its commitment to industry-wide progress, Apple benchmarked the scope and requirements of dozens of third-party sustainability standards, including upstream protocols for mineral processors and mining companies, and published this information in its Responsible Sourcing Standard. Continuing through 2018, Apple analyzed additional third-party sustainability standards and updated its benchmarking to include organizations and standards that had been strengthened and now aligned with Apples standards in specific risk categories. Apple also updated its risk mapping requirements in support of the principles of the Extractive Industries Transparency Initiative at the mining company level. In 2018, Apple also supported the development of certain industry-wide standards, including the Responsible Artisanal Gold Solutions Forums Artisanal Gold Due Diligence Toolkit; the Code of Risk-mitigation for ASM (artisanal and small-scale mining) engaging in Formal Trade (CRAFT Code) developed by the Alliance for Responsible Mining and RESOLVE, Inc., a nonprofit organization; and the Blockchain Guidelines of the Responsible Business Alliances Responsible Minerals Initiative (RMI). Apple also worked with the International Organization for Migration (IOM) to provide background information and related support in connection with the development of a set of guidelines for industry actors on how to address confirmed allegations in the upstream supply chain in accordance with UN Guiding Principles. In 2018, IOM published these guidelines as the Remediation Guidelines for Victims of Exploitation in Extended Mineral Supply Chains in English, French, Spanish, and Chinese and made them available to other industries. In 2018, Apple chaired the board of the Responsible Business Alliance, served on the Steering Committee of the RMI, continued its participation in the European Partnership for Responsible Minerals, and served on the Governance Committee of the Public-Private Alliance for Responsible Minerals Trade. Apple also contributed to several RMI working groups, including, but not limited to, the working groups for tin, gold, and other minerals; the smelter engagement team; the blockchain team; and the minerals reporting template team. Consistent with Step 2 of the OECD Due Diligence Guidance, Apple works at multiple levels in its supply chain to identify and assess risk, requiring its suppliers utilizing 3TG to submit an industry-wide standard Conflict Minerals Reporting Template (CMRT). Apple collects and processes data provided by suppliers through their completion of the CMRT and other sources of information to map Apples supply chain to the smelter and refiner level and to the mine-site level, to the extent available. Suppliers are also required, in accordance with the Responsible Sourcing Standard, to inform Apple immediately if they identify certain high risks (such as conflict risks, risks included in Annex II of the OECD Due Diligence Guidance, human rights risks and certain other risks) associated with 3TG. In 2018, Apple sought to enhance its due diligence program by further refining its reasonable country of origin inquiry through Third Party Audit programs in connection with Apples supply chain. In 2016, Apple first developed its Risk Readiness Assessment (RRA) tool to help assess risks in its supply chain beyond those associated with conflict, such as social, environmental, and human rights risks. In particular, the RRA includes assessment categories related to how smelters and refiners treat artisanal and small-scale mining formalization.3 In 2017, Apple took steps to share the RRA more broadly with stakeholders, including an international human rights non-governmental organization (NGO) that recommended companies use the RRA to stay apprised of risks in their supply chains and respond accordingly. In 2018, Apple completed the transition of the RRA to RMI to make the tool broadly available. The RRA has been increasingly utilized by companies at all levels of the supply chain in the electronics sector and other industries, such as the automotive and aerospace industries. As reported by RMI, as of December 31, 2018, 265 downstream companies and upstream smelters and refiners utilized the RRA, compared to 211 users in 2017. Apple continues to use the RRA on a targeted basis to assess risks, with a particular focus on new smelters and refiners that enter its supply chain and on additional minerals beyond 3TG. Apple believes that empowering independent voices at the mine-site level are critical to identifying and assessing risks in the supply chain. In 2018, Apple continued to provide funding to the Fund for Global Human Rights, an international human rights organization, to support human rights defenders and local activists in the DRC working on a range of issues, including economic and social rights of mining communities; inclusive economic growth; judicial advocacy; the rule of law; and health, safety, and fair compensation for mining communities. Apple also funded a project to expand a mobile platform developed by Integrity Action, an international NGO focused on reducing corruption and strengthening accountability by amplifying citizen voices through mobile platforms in multiple countries, including in the DRC. Formalization in this context means the formal establishment and recognition, through policies and commitments by relevant stakeholders, of an artisanal and small-scale mining sector. Apple continued to fund the whistleblowing mechanism of the International Tin Associations International Tin Supply Chain Initiative (ITSCI). ITSCI assists companies in the responsible sourcing of 3TG from high-risk areas and monitors mine sites and operators participating in ITSCIs traceability and due diligence program. In 2018, the OECD recognized ITSCIs alignment with the OECD Due Diligence Guidance, and the whistleblowing mechanism as a particular strength of ITSCIs overall program. ITSCIs whistleblowing mechanism allows people to place anonymous voice calls or send SMS messages in local languages to raise concerns related to mineral extraction, trade, handling, and exporting so that allegations of misconduct are surfaced and reported as ITSCI incidents. Apple believes that the whistleblowing mechanism provides a key tool in identifying risks and, ultimately, strengthening ITSCIs traceability program. With Apples continued support to expand the availability of ITSCIs whistleblowing mechanism, it is now being utilized in seven provinces in the DRC: North Kivu, South Kivu, Maniema, Haut-Lomami, Haut-Katanga, Tanganyika and Lualaba. In 2018, ITSCI and its associated on-the-ground NGO partners worked to make the mechanism more effective in its expanded geographic scope, including training investigators in the newly expanded regions on how to effectively promote the mechanism in local communities and respond to grievances being placed. Apple reviews public allegations related to certain risks outlined in Annex II of the OECD Due Diligence Guidance that are potentially linked to its supply chain. By doing this, Apple aims to bridge the reported findings from civil society and other independent voices with industry due diligence mechanisms. Apple also engages and partners with the key Third Party Audit programsin particular, ITSCI; the London Bullion Market Association (LBMA); the Responsible Jewellery Council (RJC); and RMIto address identified risks at the smelter, refiner, or mine-site level. In 2018, Apple reviewed publicly available information on certain risks, including investigative reports by international organizations and NGOs. These risks included, but were not limited to, risks in the gold trade. Apple worked with Third Party Audit programs to seek verification of the allegations to the extent reasonably possible; to advance appropriate corrective action, where necessary; and to improve due diligence processes, especially related to the gold supply chain. Apple also partnered with RESOLVE, Inc. to explore innovative and sustainable approaches to sourcing and tracing gold through the supply chain. In alignment with Step 3 of the OECD Due Diligence Guidance, Apple implements its due diligence program to respond to identified risks in its supply chain. Apple performs the due diligence measures included in Annex I to identify smelters and refiners in Apples 3TG supply chain and determine the chain of custody of 3TG included in Apples products. Apple closely monitors completion of Third Party Audits and re-audits by the smelters and refiners in its supply chain. In the instances where there are delays on the part of the smelters and refiners in implementing corrective action plans developed by Third Party Audits, Apple leverages its downstream position to conduct applicable smelter or refiner outreach to reiterate the requirement to complete and close the associated corrective action plan in order to remain in Apples supply chain. Apple believes that transparency and public reporting promote a better understanding of the success and challenges of industry-wide due diligence efforts. Since 2015, Apple has worked with ITSCI to monitor incidents generated through the ITSCI reporting system relating to incidents of abuse potentially associated with mine sites, operators, and transport routes in the DRC and adjoining countries. Apple has also provided financial and non-financial support for the development of the incident review process with ITSCI. Incidents are initially identified through a variety of channels, including through ITSCI field agents, ITSCIs Apple-supported whistleblowing mechanism, NGOs, and United Nations reports. Apple reviews these incidents to understand if any such incidents potentially involved individuals, identified as members or potential members of organizations within the meaning of armed groups, as defined in Item 1.01(d)(2) of Form SD (armed groups), possibly linked to smelters and refiners reported in Apples supply chain. Apple believes that industry-wide due diligence efforts will be strengthened if more downstream and upstream actors review and respond to incidents and associated risks identified on the ground. As reported in Apples Conflict Minerals Report for 2017, seven of the more than 1,200 incidents reported by ITSCI and monitored by Apple were identified for potential linkage to Apples supply chain and armed groups. In particular, the police in the DRC, the DRC national army, and the Mai Mai group, an armed group in the DRC, were alleged to be involved. Three of these seven were reported closed at the end of 2017, as reported in Apples Conflict Minerals Report for 2017. In 2018, ITSCI informed Apple that the remaining four incidents reported by ITSCI had been closed, in accordance with ITSCI criteria, after ITSCIs follow-up. Of the four, one was closed after a local exporter agreed to no longer make payments to the DRC national army and a representative of the DRC national army indicated that appropriate action would be taken against members of the DRC national army involved. ITSCI closed the remaining three incidents due to insufficient evidence or engagement by local authorities. In 2018, Apple monitored over 1,300 ITSCI incidents opened from January to December. Of the ITSCI incidents reviewed, Apple identified eight potential incidents involving the police in the DRC and/or the DRC national army in connection with a variety of alleged illicit activities. Based on information received to date, these alleged illicit activities ranged from fraud and bribery or illegal payments or taxation, including at mining sites and checkpoints or road barriers, to corruption and other criminal activity, potentially for personal gain. Of the eight identified incidents, three have been closed and five remain open with investigations or corrective actions still in progress, which Apple intends to continue to monitor. In one of the closed incidents, members of the DRC national army had been paid to provide security at the mine site but, following an investigation, were removed from the area, while representatives of the DRC national army were retrained on appropriate security and human rights practices. For the remaining two closed incidents, in one instance, the risk of impacted minerals entering the supply chain is believed to be limited under the circumstances, and in the other instance, efforts were made to have any affected minerals set aside, while the affected mining site and transport route were discontinued from use. Apple has not, to date, been able to determine whether the reported incidents were connected to specific 3TG included in Apples products. The challenges with tracking specific mineral quantities through the supply chain continue to prevent the traceability of any specific mineral shipment through the entire manufacturing process. 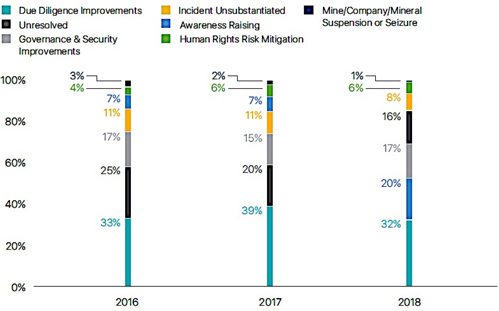 Since 2016, each of Apples Conflict Minerals Reports has included an analysis of outcomes of ITSCI incidents monitored and closed in that reporting year. This analysis provides a snapshot of the corrective actions taken to address relevant incidents. Apple believes this analysis has provided further transparency to ITSCIs operations and a deeper understanding of remediation and mitigation measures. ITSCI also publishes descriptions of the incidents, which enable due diligence by interested stakeholders. Following its review of outcomes for incidents closed by the end of 2018, Apple observed that due diligence improvements account for the largest percentage of reported outcomes over the previous three-year period and that awareness-raising activities significantly increased in 2018. Apple intends to continue its review of high-risk incidents in the future. Does not include over 500 open incidents with outcomes in progress through ITSCI for 2018. A particular incident may have one or more outcomes and, accordingly, may be counted in one or more associated categorizations. Underlying data provided by ITSCI; categorizations provided by Apple, which may differ from ITSCI classifications. Apple believes Third Party Audits remain the foundation of robust due diligence systems. In particular, Apple believes that Third Party Audits play a significant role in providing assurances that smelters and refiners have appropriate due diligence systems in place and help ensure that operations and sourcing practices do not support conflict in the DRC and adjoining countries. To date, through advocacy and influence, Apple has driven a steady increase in smelters and refiners participating in Third Party Audits. In 2015, Apple reached its goal of a 100 percent rate of participation in Third Party Audit programs by identified smelters and refiners in its supply chain, and Apple continued to achieve a 100 percent rate of participation in 2016, 2017, and 2018. See Annex II for additional breakdown of reported smelters and refiners. If smelters or refiners are unable or unwilling to meet Apples high standards, Apple will take necessary actions to cause the termination of the applicable business relationships with such smelters or refiners. In 2018, Apple directed its suppliers to remove from its supply chain five smelters and refiners not willing to participate in, or complete, a Third Party Audit or that did not otherwise meet Apples requirements on the responsible sourcing of minerals. In 2018, Apple also took steps to strengthen its due diligence system in alignment with the key priorities for strengthening supply chain due diligence described in the OECDs Alignment Assessment of Industry Programmes with the OECD Minerals Guidance. In particular, Apple took steps to monitor risks beyond those specifically addressed by Third Party Audits, including the full scope of risks outlined in Annex II of the OECD Due Diligence Guidance, and to apply its due diligence activities outside of the DRC and adjoining countries. As part of its human rights due diligence and commitment to safeguard the well-being of people involved in its supply chain, Apple expanded its efforts to integrate human rights impact measurements into its responsible sourcing program in 2018. Third Party Audits are not currently designed to capture or assess to what extent conditions for people living in the affected countries are improving. Apple believes that measuring human rights impacts is a critical part of its due diligence process and that stakeholders should work together to further measure the impact of 3TG due diligence systems. In 2018, Apple continued funding the International Peace Information Service (IPIS), an independent research institute, to measure the impact of due diligence programs on mining communities. IPIS worked together with Ulula LLC, a software and analytics company, to collect data through field visits and a mobile-based survey campaign from two sets of respondents: people living in and around mine sites with due diligence programs and people living in and around mines sites without due diligence programs. The study found that there were lower levels of armed actor interference and a higher presence of government-sponsored mining services at mine sites with due diligence programs. Respondents living around mine sites with due diligence programs reported witnessing mine accidents and instances of corruption less often than their counterparts at mine sites without due diligence programs. However, respondents at mine sites with due diligence programs also reported a decrease in wages in the past year, and a sentiment that it was difficult to support themselves and their families on current income levels. Apple also provided funding to two additional partners to initiate work to evaluate human rights impacts of minerals certification and traceability programs on communities living on or around mine sitesfaculty in the Department of Public Policy at the University of California at Los Angeles are conducting statistical analyses of relevant in-region datasets; and the Harvard Humanitarian Initiative is collecting data on economic outcomes, as well as on gender and human rights issues, through quantitative and qualitative research in the DRC. In 2018, Apple also funded an international expert and an organization specializing in land rights to conduct initial research for a human rights impact assessment (HRIA) of the impact of a potential traceability project on a local community in the DRC. Results from the HRIA research informed Apples decision-making with respect to the location of the potential project. Apple believes that more data is needed to track progress on human rights improvements on the ground and that all stakeholdersgovernment, NGOs, industry, and local communitiesshould work together to measure impact and improve the situation on the ground. In alignment with Step 5 of the OECD Due Diligence Guidance, Apple reports annually on its due diligence requirements through, among other means, its annual Conflict Minerals Reports filed with the Securities and Exchange Commission and its annual Supplier Responsibility Progress Reports. Apple also provides reports that contain information on certain products environmental performance including data on some materials, such as, where relevant, 3TG. In addition, Apple publishes annually a list of the facility locations for its top 200 suppliers, and, in 2018, this represented at least 98 percent of procurement expenditures for materials, components, and assembly of Apple products worldwide. Apple also publishes, at a minimum, on an annual basis, a list of all identified 3TG smelters and refiners, as well as identified smelters and refiners of cobalt, of which 100 percent participated in third-party assessment audits in 2018. Apple believes that addressing incidents and allegations potentially affecting only Apples supply chain will not lead to lasting progress on the ground. Accordingly, Apple has taken steps to mobilize a broad group of stakeholders to take action on public allegations. In 2018, Apple funded the development of an industry-wide grievance platform with RMI. Working in cooperation with industry, NGOs, and Third Party Audit programs, the multi-stakeholder grievance platform seeks to increase transparency, consistency, and accountability in how public allegations involving smelters and refiners are identified, addressed, and resolved. In addition, allegations are reviewed and managed by an independent third party with supply chain due diligence expertise. Participation in the platform allows involved stakeholders to conduct deeper due diligence in their minerals supply chains, drive toward collectively addressing potential abuses on the ground, and transparently report on progress. Encouraging its suppliers to adopt best practices for the responsible sourcing of materials. Collaborating with industry groups and NGOs to continue improving traceability of 3TG. Supporting independent local stakeholders to identify relevant risks and raise grievances related to conditions in and around mining areas for 3TG. Working with stakeholders, including the OECD, to measure impacts of due diligence programs on conditions in the DRC and adjoining countries. Continuing to collaborate with relevant stakeholders to improve on how incidents and allegations are tracked and addressed on a transparent, industry-wide basis. 253 smelters and refiners were determined to be in Apples 3TG supply chain as of December 31, 2018. 4 smelters and refiners were subsequently found to be inoperative in 2018. 44 were, initially, erroneously, or unintentionally reported in 2018 by suppliers due to reasons such as changes in a suppliers supply chain or product line, or changes in a suppliers declaration of scope in the suppliers CMRT. Apple took steps to verify that its suppliers did not allow the 44 smelters and refiners to re-enter or remain in Apples supply chain. 5 were removed that had been previously participating but subsequently stopped participating in a Third Party Audit program; were not willing to participate in, or complete, a Third Party Audit within given timelines; exceeded Third Party Audit corrective action plan timelines; and/or were removed at Apples request due to not meeting the Supplier Code and/or Responsible Sourcing Standard. 2 were compliant with Apples Responsible Sourcing Standard but were removed on suppliers own initiatives. Apples reasonable country of origin inquiry is based on Third Party Audit information and, to the extent that country of origin information has not been audited, additional information collected by others. To the extent reasonably possible, Apple has documented the country of origin of identified smelters and refiners based on information received through RMIs Responsible Minerals Assurance Process (RMAP), the LBMA, a survey of smelters and refiners, and/or third-party reviews of publicly available information. However, some country of origin information has not been audited by a third party because, among other reasons, applicable smelters and refiners have gone out of operation before completing a Third Party Audit or the particular Third Party Audit program either did not provide, or has not yet required reporting of, country of origin information from all smelters and refiners. Therefore, Apple does not have sufficient information to conclusively determine the countries of origin of the 3TG in all of its products; however, based on the information provided by Apples suppliers, smelters and refiners, as well as from the RMI, LBMA, and other sources, Apple believes that the 3TG contained in its products originate from the countries listed in Annex III, as well as from recycled and scrap sources. Of all 253 of the smelters and refiners of 3TG determined to be in Apples supply chain as of December 31, 2018, Apple found no reasonable basis for concluding that any such smelter or refiner sourced 3TG that directly or indirectly finance or benefit armed groups. Of the 23 smelters and refiners known to be sourcing from the DRC or an adjoining country, 23 participated or continued to participate in a Third Party Audit in 2018 involving the review of the traceability of the smelters or refiners 3TG, in addition to a validation of its due diligence systems and country of origin information. The foregoing does not include smelters and refiners indirectly sourcing from the DRC or adjoining countries by acquiring 3TG from these 23 smelters and refiners. This report has been prepared pursuant to Rule 13p-1 under the Securities Exchange Act of 1934, as amended, for the reporting period from January 1 to December 31, 2018. This report relates to the process undertaken for Apple products that were manufactured, or contracted to be manufactured, during 2018 and that contain 3TG. These products are Apples iPhone®, iPad®, Mac®, iPod®, Apple TV®, Apple Watch®, AirPods®, HomePod, Beats® products, and Apple accessories. Third-party products that Apple retails but that it does not manufacture or contract to manufacture are outside of the scope of this report. The smelters and refiners identified in this report include smelters and refiners producing inputs for service or spare parts contract manufactured in 2018 for use in connection with the subsequent service of previously sold products, including products serviced in subsequent years using those parts. This report does not include smelters of tantalum, tin, and tungsten and refiners of gold where such 3TG are included in end-of-life service parts for products that Apple no longer manufactures or contracts to manufacture. This reports use of the terms smelters and refiners refers to the facilities (i.e., a smelter or refiner) processing primary 3TG to retail purity. Apple suppliers have in some cases reported smelters and refiners that Apple believes are not operational or may have been misidentified as smelters and refiners. As a result, Apple continues to conduct independent research on smelters and refiners and to work with suppliers throughout its supply chain to revalidate, improve, and refine their reported information, taking into account supply chain fluctuations and other changes in status or scope and relationships over time. Identified smelters and refiners are those that (i) have been reported in supplier surveys, (ii) Apple believes are currently operational, were operational at some point during the applicable year or, while inoperative, were capable of re-engagement with minimal delay or effort, and (iii) otherwise meet the definition of a smelter or refiner, provided that Apple may determine to treat a third party as an identified smelter or refiner notwithstanding a reclassification of such third party or a change in its status. As part of its reasonable country of origin inquiry, Apple has determined that certain suppliers are utilizing at least some 3TG from secondary materials (i.e., scrap or recycled material). In such cases, the suppliers continue to provide a CMRT and remain subject to Third Party Audit requirements with respect to their identified smelters and refiners. In addition, certain identified smelters and refiners are believed to process at least some 3TG from recycled or scrap sources, although such identified smelters and refiners continue to participate in Third Party Audits or, in the case of one smelter using only recycled or scrap material, other verification processes. Participating smelters and refiners are those that have agreed to participate in, or have been found compliant with, the RMAP or cross-recognized independent third-party conflict minerals audit programs confirming their 3TG sourcing practices. Such programs may also include audits of traceability requirements, conformity with the OECD Due Diligence Guidance, management systems, and/or risk assessments. Cross-recognized independent third-party 3TG audit programs include the LBMAs Responsible Gold Program and the RJCs Chain-of-Custody Certification. Throughout this report, the audits by these programs are included in references to Third Party Audit programs. This report includes forward-looking statements, within the meaning of the Private Securities Litigation Reform Act of 1995, which involve risks and uncertainties. Forward-looking statements provide current expectations of future events based on certain assumptions and include any statement that does not directly relate to any historical or current fact. Forward-looking statements can also be identified by words such as expects, plans, intends, will, may, and similar terms. Forward-looking statements are not guarantees of future performance. Apple assumes no obligation to revise or update any forward-looking statements for any reason, except as required by law. Subsequent events may affect Apples future determinations under Rule 13p-1. Apple designed its due diligence measures to conform in all material respects to the OECD Due Diligence Guidance. Apple seeks to meet and exceed internationally accepted due diligence measures on the traceability of 3TG in its supply chain. Apple maintained a strict Supplier Code and Supplier Responsibility Standard that apply to all levels of the supply chain and include the requirement that smelters and refiners in Apples supply chain must participate in Third Party Audit programs. Apple communicated to suppliers in its supply chain Apples policy governing 3TG originating from the DRC and adjoining countries and provided additional support to suppliers through online training and, in some cases, tailored communication and guidance throughout the year. Mapping Apples supply chain to the smelter and refiner level, and to the mine-site level to the extent available, by collecting and processing data provided by suppliers through their completion of a CMRT and other sources of information. Engaging an independent audit firm to conduct specialized audits of certain suppliers in order to review their internal management systems and implementation of Apples requirements for the responsible sourcing of minerals. Requiring suppliers to inform Apple if they identify certain high risks (such as conflict risks, risks included in Annex II of the OECD Due Diligence Guidance, human rights risks and certain other risks) associated with 3TG. Apple continued to conduct outreach to smelters and refiners to reiterate its requirement to complete a Third Party Audit in order to remain in its supply chain. In 2018, Apple directed its suppliers to remove from its supply chain five smelters and refiners not willing to participate in, or complete, a Third Party Audit or that did not otherwise meet Apples requirements on the responsible sourcing of minerals. Reviewing publicly available information such as investigative reports from international organizations and NGOs. Working with Third Party Audit programs in connection with certain smelter, refiner, or mine-level allegations to seek verification of the allegations, to the extent reasonably possible, and to advance appropriate corrective action, where necessary. Continuing its financial and non-financial support for the development of an incident review process with ITSCI in 2018. Apple monitored and analyzed ITSCI reports of incidents occurring in 2018 to identify incidents that may be related to potential armed group interference in applicable mineral supply chains; and whether the incidents could be linked to smelters in Apples tin, tantalum, or tungsten supply chains. Apple worked with Third Party Audit programs to improve due diligence processes and explored innovative and sustainable approaches to sourcing and tracing materials, including but not limited to gold. Apple continued to support initiatives at the mine-site level through its financial support of ITSCIs whistleblowing mechanism in seven provinces in the DRC, funding the Fund for Global Human Rights for its work with local human rights defenders in the DRC, and expanding its efforts to integrate human rights impact measurements into its responsible sourcing program by funding several research partners to investigate the impact of due diligence programs on mining communities. Apple caused an increase in the number of smelters and refiners participating in Third Party Audits. Apple supported the development of certain industry-wide standards. Apple made its RRA tool available to the electronics sector and other industries by completing the transition of the tool to RMI. Apple continued to work with key stakeholders to further develop a multi-stakeholder grievance platform to increase transparency, consistency and accountability in how public allegations are identified, addressed and resolved in order to drive toward addressing potential abuses on the ground. List 1: Smelters and refiners reported in Apples supply chain as of December 31, 2018. Certain terms used in this Annex are defined in the report. * The smelter/refiner is believed to process at least some 3TG from recycled or scrap sources. ** The smelter/refiner has changed its compliance or operational status since December 31, 2018. *** The smelter/refiner continues to be in the process of removal as of the filing of this report. List 2: Smelters and refiners identified in Apples supply chain during 2018, but subsequently determined to be inoperative or removed prior to December 31, 2018. Note: Smelter and refiner facility names originate from information provided by the LBMA and/or through the RMAP. * The DRC or adjoining countries. ** Minerals from this country were substantially transformed before being incorporated into finished products. Such a substantial transformation of the minerals happened outside of the United States in a third country by a person other than a United States person.